While this hat is probably not actually well-suited to hunting wabbits (or ducks), it does remind me a bit of traditional hunting caps when you tie the earflaps up- only, much cuter. With buttons. And pom-poms. (Ok, fine, it bears very little resemblance.) 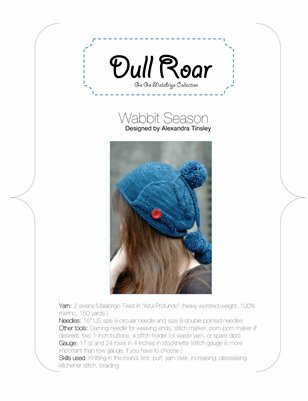 Flaps down, your ears will be super cozy under double-thick layers that also serve as pockets! (For what? Up to you.) Malabrigo Twist is positively scrumptious and this hat is about as comfy as they get. It is worked from the top down, and then extra stitches are cast on to create the pocketed earflaps, one at a time. Add some pom-poms and you’re off! Tassels are also acceptable ;-) I’m a fool for tassels.